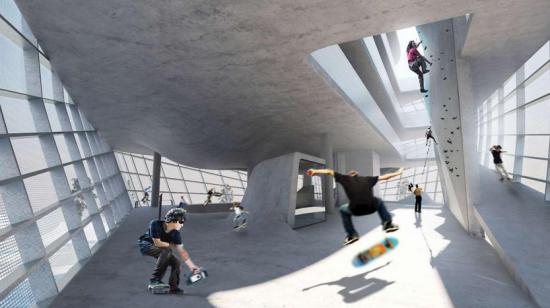 Local government has given the go-ahead to a multi-tiered skatepark designed by Guy Hollaway Architects (GHA) to be built in the town of Folkestone, England. After multiple proposals from GHA and the design consultancy Maverick, the plans promise a state-of-the-art urban sports facility. This project’s arrival comes at a time where skateparks face an uncertain future in Britain. Last year saw the closure of ad hoc skatepark Bristo Square in Edinburgh, Scotland. Down in London, plans to remove the iconic Southbank skatepark were halted by the “Long Live Southbank” group with the support of London mayor, Boris Johnson. This 10,700-square-foot structure features three floors, each containing quarter-pipes, ramps, and ledges. 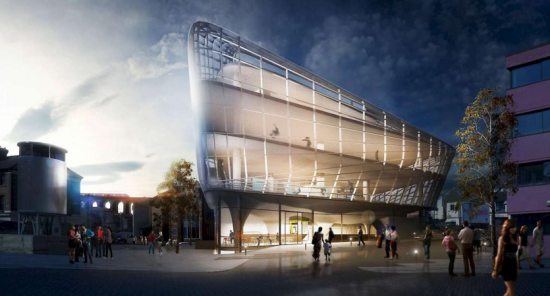 Two layers of metal mesh outline the skatepark to create natural ventilation on all three levels. In addition to skateboarding, the facility includes spaces for BMX-ing, rollerblading, and scootering. 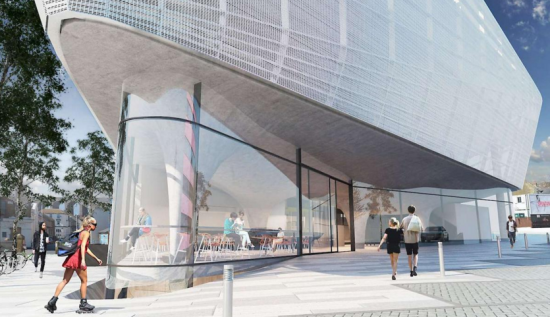 There are also plans for a bouldering gym, cycling center, boxing club, cafe, and rooftop area. With $12.8 million in funding secured from The Roger De Haan Charitable Trust, construction on the site can begin. The skatepark is expected to be ready for opening within the next two years. 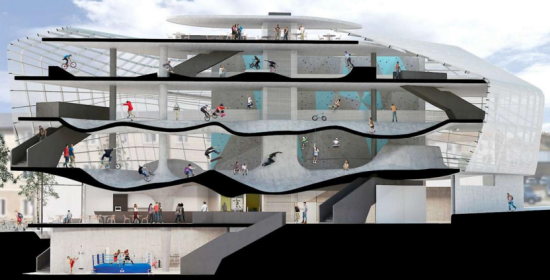 Folkestone’s wider district of Shepway—and the members of the Shepway District Council, who approved the design—hope that it will become a national and international attraction while offering a recreational facility for local youth. With a monthly membership, residents will be offered lower prices as a way of protecting and expanding the local skate and BMX scene.